TravelQuest has the answer. In the summer of 2017, join us for a unique odyssey along America’s Pacific coast, stopping to explore three landmark cities: Seattle, Portland, and San Francisco. And then experience the first North American total solar eclipse in nearly four decades – the first visible from the contiguous states since 1979. After a rendezvous in Seattle, we travel southward, exploring Mount Hood and the Columbia River Gorge en route to Bend, Oregon. 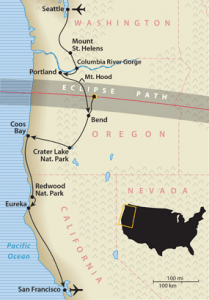 And then on eclipse day – Monday, August 21, 2017 – we head out in the morning to our specially selected site and experience 2 minutes and 2 seconds of totality with some of the best viewing prospects along the entire continental track. It’s the crowning moment in a journey that weaves together three dynamic cities with a whole array of natural wonders, from Crater Lake to California’s redwood forests – and, of course, an unforgettable experience in the Moon’s shadow. Experience the spectacle of the total solar eclipse on August 21, 2017 – the first in North America in nearly four decades.